Anyone who wants to eat with the seasons eventually confronts winter greens. Piles of kale, mustard greens, chard, collards and dandelion greens dominate the farmers markets where I shop at this time of year. If I’m lucky, there will be artichokes and broccoli sprouts, too. But the greens are everywhere, challenging me to find new ways to put them on the dinner table. Lately, I’ve been turning some of the more pungent greens into a salad inspired by Elizabeth Schneider’s “Uncommon Fruits & Vegetables” (William Morrow, 1986). More than a cookbook, it’s an encyclopedic guide to the produce rarely found in markets before Americans became obsessed with food. I often find ideas there for vegetables few other cookbooks even address. The original recipe calls for mustard greens and avocado dressed with a boiling hot sweet and sour dressing, which complements the strong flavors of winter greens. I’ve translated it to dandelion greens, which are more widely available and require a little less prep work than mustard, and a dressing based on Asian ingredients. Toasted walnuts introduce pleasant crunch and earthy flavor. It’s true, winter greens are an acquired taste for many people. I, for one, didn’t grow up eating them. My dad barely tolerated broccoli and he certainly didn’t want to eat any of the assertive greens that reminded him of growing up poor in southern Oklahoma. Iceberg lettuce was his favorite leafy green. My tastes have broadened over time, however, and I’ve developed an appreciation for greens with character. Arugula and radicchio are favorites. I’ve even made friends with kale. 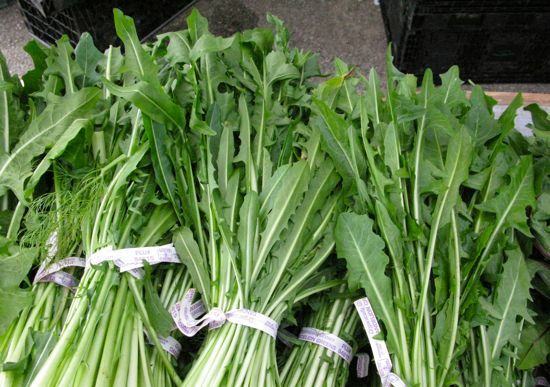 Still, mustard and dandelion greens were daunting when I began encountering them at farmers markets. The leaves were sturdy and the flavor was sharp and peppery. They were not for the timid palate. Shredding the leaves makes these greens more approachable, I’ve learned. They’re easier to chew and the flavor somehow seems more delicate. Adding a hot dressing, as in the classic wilted spinach salad, makes them more tender and a touch of honey softens the bitter edge. This dandelion greens salad is tasty enough to convert many a greens-phobe. It’s also packed with vitamins, minerals, fiber, calcium and antioxidants. You can dress it up with crumbled blue cheese or sections of juicy clementine but it’s delicious as is. Winter salads don’t get much better. Wash dandelion greens thoroughly, shake out excess water and roll leaves between two clean kitchen towels to dry, or whirl in salad spinner. Starting at the top of the leaves, slice crosswise into ribbons about 1/4-inch wide. Discard the stem ends. Place shredded greens in a medium bowl. Before serving, combine vinegar, oil, honey, fish sauce, and sriracha in a small saucepan. Stir until well combined and bring to a boil over medium heat. Pour hot dressing over greens in the bowl and toss. 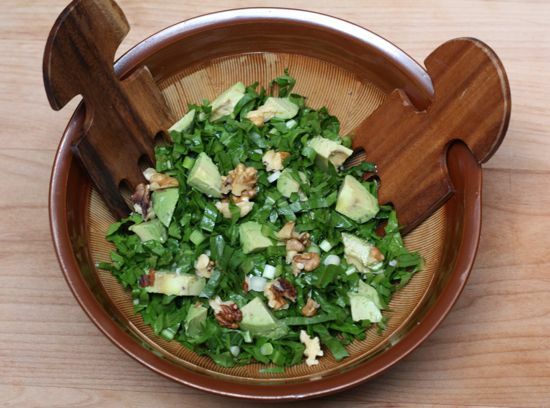 Sprinkle greens with walnuts, avocado and green onions and toss again.